Assuming you do not fall into either of the above categories the IPL method of hair removal is an extremely effective long term solution. As with all other methods you need to be patient to get the perfect results you want but typically after only 2 IPL treatments (usually 2 weeks apart) the hair will already be noticeably less. However, following the advice below will turn great results into fantastic results. 1. Depending on your skin colour and hair colour you should set the intensity of the light so as to optimise performance. Many of the IPL hair removal systems out there come with in-built skin sensors that automatically check the light is safe to use on your skin and set the light intensity accordingly. Where the device does not have this feature they will provide a skin type chart like the one displayed here so you can easily check exactly what settings to use. 2. IPL works best on fairer skin as it can absorb the intense light easier so you’ll find it much more effective if you haven’t come back from holiday with a beautiful tan. 3. IPL also works best when your skin is nice and cool so pick a time when you are relaxed and not hot from having a bath or doing strenuous exercise. Saying that, all skin types can feel more sensitive on certain days due to hormones or stress levels so give it a miss if that happens. 4. Being hot not only makes the IPL process less effective but obviously a natural side-effect of getting hot is sweating. Sweat and anything else that makes your skin moist such as body creams can sometimes make the IPL treatment uncomfortable. Although body creams are not advised you can still use IPL Conductive Gels onto the area to be treated prior to use as it acts a bit like a magnifying glass and helps ensure that the light penetrates as effectively as possible through the skin to reach and damage the hair root. You’ll not find many of the home IPL brands suggesting this though and it is not essential. 5. You should shave the area you intend to treat so the light from the IPL reaches the hair root more effectively. As the light creates heat you can singe long hairs which not only smells unpleasant but can stick to the the IPL lamp head. 6. As the light is turned into heat energy you can potentially cause discomfort in the form of prickling if set too high for your skin type. When you first start to use any IPL equipment it is therefore advisable to start at the lowest recommended setting (there are typically 5 levels) and gradually build up the intensity – if it starts feeling unpleasant then you know what your limit is and you can just turn it down a level. 7. You’ll naturally be keen to see results but you will need a few sessions to start seeing significant results. This does not mean you should be treating yourself daily to hurry things along, in fact you’ll probably just cause skin irritation. When you start it’s been proven you get the best results if you do one session every 2 weeks on bikini and armpits and every 4 weeks on legs. After that you can get more aggressive and give any hair growth treatment if you see it growing though again. 8. Just to give you some peace of mind, hair can seem to be growing still up to 2 weeks after your last treatment – this is perfectly normal and it is called ejection. But you’ll quickly notice that most of the hairs will be falling out or can be easily pulled out. If this does not happen then these more stubborn hairs will need subsequent IPL treatment. 9. Treated skin areas should be slightly overlapped to ensure total coverage of the area with the IPL product. It is quite tricky to sometimes work out what areas you have zapped when treating larger areas so try and work methodically in straight rows. 10. 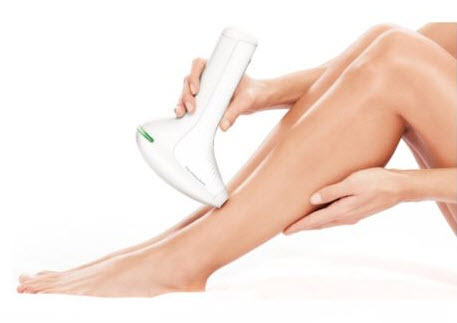 Many of the leading hair removal systems are cordless these days so if treating a larger area such as the legs you may find you need to charge the device again (this can take up to 2 hours) to finish. Just make sure it is fully charged before you start as picking up where you left off is a hassle – or alternatively get a mains powered device such as the Remington models.